On Friday the Jewish Chronicle published this article by my libel blogging mate David Osler (aka other names). 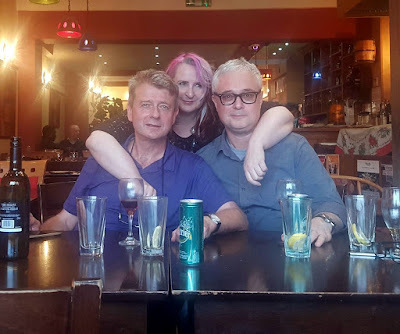 By coincidence that day I met with Dave and his partner Stroppy in a Hackney restaurant for a prearranged "put the world to rights" meal, gossip and drink. "Appealing for an outbreak of sweet reason between Zionists and anti-Zionists is never easy, especially when undertaken by a veteran Marxist with political views a long way from those of the average JC reader. But, at the risk of displeasing both sides, I want to urge the hard-left to back the International Holocaust Remembrance Alliance’s definition of antisemitism. Then let me double down, and urge Jewish organisations to commit to using this reasonable instrument in a reasonable way. The issue hit the headlines after Haringey last week became the latest local authority to adopt the document, despite opposition from sections of the left. I say “sections of the left” deliberately. Both Jeremy Corbyn himself and Labour left umbrella group Momentum have explicitly made clear they see no problem here. Lining up against are primarily those socialists who maintain the IHRA definition somehow outlaws legitimate criticisms of the Israeli state, to the detriment of work for Palestinian rights. And legitimate criticisms aplenty can be levelled at the actions of Israel’s government. But illegitimate criticisms inspired by traditional Protocols-style antisemitism are sadly in circulation, too, and those are the ones on which the IHRA concentrates. Its two-sentence formal definition of antisemitism is worded so broadly that no anti-racist could object. The same goes for much of the rest of the document. Disagreement centres on just one or two lines, in particular the stipulation against “denying the Jewish people their right to self-determination”. Much hinges on the interpretation of this passage. Here, Zionists and anti-Zionists alike are going to have to display common sense. Fairly read, the clause does not preclude advocacy of any standard radical formula. The status quo, the two state solution, a bi-national democratic secular state, a democratic socialist federation of the Middle East, or even the anarchist “no state” stance are all proper propositions for discussion. After all, any settlement actually agreed by those that live in the region exemplifies, on any reasonable construal, self-determination in action. Anything less is resolutely contrary to that principle. That is the politics of the fascist right and revanchist nationalism, not the politics of the left. And it goes without saying that accurate reportage is always valid, even where it shows the Israel Defence Forces or Jewish politicians anywhere in a poor light. Meanwhile, if the unnecessarily parlous state of relations between the left and the Jewish community — which likely cost Labour seats in June — is to be overcome, the first step should be to rebuild bridges. So don’t cat-call from the public gallery next time IHRA comes up for debate, comrade. Urge your Labour councillor to support it".